Gifted Services Parent Resource Materials: The APS Gifted Services Office provides a mini-library of resources to the families through the Parent Resource Center (PRC). The PRC is located at the Syphax Education Center, 2110 Washington Boulevard, Arlington, VA 22204. Please call before visiting as hours fluctuate, 703-228-7239. 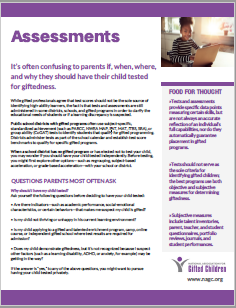 The Timely Information for Parents (TIP) Sheets are for parents and caregivers of gifted children to download, read, and share as needed. Please keep in mind these are developed for a national audience and each school district will varying in implementation. 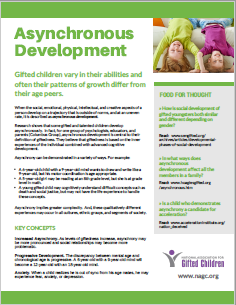 Asynchronous Development: Gifted children can develop at an uneven rate, confusing parents, friends, and teachers. This web site contains FAQs about Gifted Education, links to the state regulations and state and national organizations related to Gifted Education. 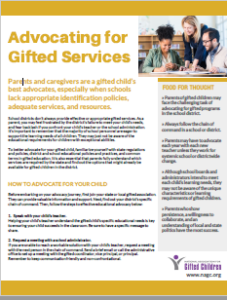 Other documents available on this page include: Understanding the Regulations Governing Educational Services for Gifted Students and the Reference Guide for the Development and Review of the Local Plan for the Education of the Gifted and Supporting the Identification and Achievement of Twice-Exceptional Students. VA Gifted advocates for gifted children and services at the state level, publishes a quarterly newsletter, and holds bi-annual conferences. A Career and Academic Planning Experience for High-Ability Students in Grades 6-12 and their ParentsAn annual add-day career and academic planning event sponsored annually in January by The Center for Gifted Education at the College of William and Mary and held in Williamsburg, VA.
Offers a variety of information from the Virginia Department of Education Web site. The Commonwealth of Virginia provides services to identified students, kindergarten through grade 12. NAGC is a non-profit organization of parents, teachers, educators, other professionals, and community members who unite to address the unique needs of gifted children and youth. NAGC publishes a quarterly journal, a parenting magazine, and holds an annual conference. Supporting Emotional Needs of the Gifted (SENG) SENG is dedicated to fostering environments in which gifted adults and children understand and accept themselves and brings attention to the unique emotional needs of gifted children. The National Society for the Gifted & Talented™ (NSGT) is a non-for-profit foundation created to honor and encourage gifted and talented children and youth. CEC is the largest international professional organization dedicated to improving educational outcomes for individuals with exceptionalities. CEC includes a TAG (Talented and Gifted) division. Formed in 1999, the Davidson Institute is a 501(c)3 private operating foundation funded by Bob and Jan Davidson to recognize, nurture and support profoundly gifted students and to provide opportunities for them to develop their talents. 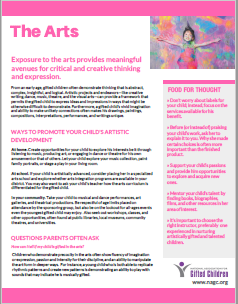 A variety of free brochures that can guide parents in the support of their children. The Foundation also provides a variety of scholarship opportunities. The Jack Kent Cooke Scholarships are designed to encourage and support outstanding students from 7th grade through graduate school who have a breadth of interests, work hard, demonstrate a strong will to succeed, and have financial need. The Emerging Scholars Program (ESP) is designed to encourage and support outstanding students with financial need in grades four through six. ESP was established in late 2002 by a consortium of seven independent schools serving the Washington, DC area. Emerging Scholars Program Graduates undergo 14 months of rigorous academic and leadership training. Graduates have been accepted into grade six at independent schools where they will receive need-based financial aid or graduates go on to greater success at their home public schools. This Web site is an “all-things-gifted” resource for parents, educators, and gifted teens. 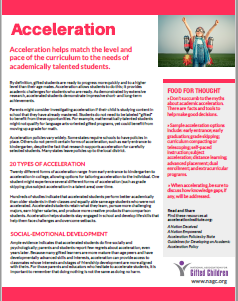 Early entrance programs, often referred to as radical acceleration, provide an opportunity for groups of students who have yet to complete high school to become a part of a supportive peer environment within a collegiate setting. Various college early entrance programs allow these students to work toward either a full college degree or a high school diploma plus transferable college credit. PEG, the Program for the Exceptionally Gifted, at Mary Baldwin College in Staunton, Virginia, http://www.mbc.edu/peg/ offers an opportunity for bright and accomplished young women to complete college during their high school years.